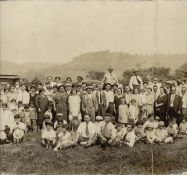 In both 1925 and 1926, the immigrants from San Pietro Avellana held a reunion picnic near Koppel, PA. In the museum in SPA, group photos from both picnics are displayed. 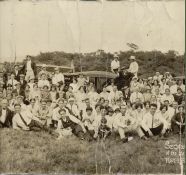 This photo is from the 18 July 1926 picnic. I don't have a copy of the 1925 photo yet. I got this email from Glenn who gave his thoughts on the location of the SPA picnic. Some googling shows that there is a lot about the Buttermilk Falls in Homewood (AKA Homewood Falls) and not much about the falls in Koppel. I think this picture was taken at the original Buttermilk Falls in South Koppel PA, I have been to this falls and have a picture of it, Koppel PA fire dept also has numerous pictures of Koppel's Buttermilk Falls, My mom used to talk about going there when she was young, and a lot of the old timers from Koppel know about it. I also have a picture of the falls, and myself and 2 of my friends where there a few years ago, it is about a mile from where I live. They call Buttermilk Falls in Homewood PA that but the original one is in Koppel. I found one photo of what is said to be Buttermilk Falls in Koppel. Click Here. The first copy of this photo was found in 2006 by Dave De Sanzo. He found it at the home of Cheryl Mariani Palmieri in Pittsburgh, PA. Cheryl's father Bob Mariani originally got the photo from someone in Akron, OH who was going to throw it away. Dave heard about the photo and made arrangements with the family to borrow it. He took it to a photo shop in Conway, PA and they scanned the photo and did some retouching. Our thanks go out to the Mariani family for letting us borrow the original photo. Wowee wow wow. 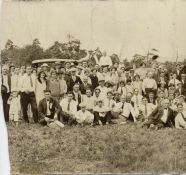 My name is Susan Morelli Wolf and my friend and I have been working on restoring the 1926 picnic photo. I have an original that is in so-so condition--cracks, etc. My friend has been lovingly restoring it for over two years. We are sending you a snippet of it, but the whole thing has been restored. I will be bringing it to the Morelli family reunion in Columbiana, Ohio, which is near Youngstown Ohio. It takes place yearly the second weekend of September. It is a gathering of the three Morelli sons who came to the US. My friend Barbara Himes who has been working on the photo just happened to Google 1926 Avellana and came across your web site. We love your website. What a treasure! My grandfather Anthony P. Morelli is no. 272, the man with the cigar and wide tie. My grandmother, Pierina Colavecchi (need to check on spelling) Morelli is no. 252, and my father, Robert Eugene Morelli is no. 256. If you would like us to forward the photo, let me know. It has a lot of detail because she scanned it in seven sections. It's 11,000 KB so it may or may not be e-mailable. I am working on a way to get the larger scanned image here. I don't want to just put the photo on the web page as that would make the page very slow in loading. In the meantime - Click here to download a larger version of the photo - Caution about 4 MB!! Here is an "Outline" version of the photo where I outlined each person and then numbered them - there are 341 people in the photo! The file is about 900KB. With this numbering complete, we can start to identify each person in the photo. If you wish to get a print made of this photo, I have a 11MB version. Let me know and I can get it to you on CD. For as long as I can keep this file on-line, here is the 11MB super high resolution version of the photo. It is a JPG format file. Any photography shop should be able to make a very nice large print from this file. The original photo was 36" by 8". At right: Luzrezia Carlini Frazzini (#97) and daughter Benilda Frazzini (#101) - grandmother and mother of me, Mark DiVecchio. Originally identified by Wilberta Illig who had a better eye for my mother and grandmother than I did! In 2013, Bob Ricci reminded me that the young man in the lower left of this crop is his father, Louis Ricci (#85). Wilberta's comment was based on the first, lower quality, photo that we had. On this new 2008 restoration, its pretty easy to identify my mother and my grandmother. I have talked to my mother about this and she confirms that the girl in the photo is probably her. She does not recall the picnic, though. My mother only arrived in the US a few months earilier (May 1926). I'm guessing that Oriente was one of the organizers of the picnic. Look at the lapel flag. Its bigger than seen on most and I'll bet it was red, white and green. You can see about a dozen men kneeling in front who have the larger flag ribbon pined to their coats or shirts. I have been trying to identify the item that Oriento Carlini is holding in his hand. I zoomed in as far as I could and still could not make it out. How's this for a guess.What if Oriento is holding the 1925 Koppel picture in his hand? Would his motive have been to position everyone in the 1926 picture similar to the 1925 picture? Dave, you might be on to something there.... It is not a newspaper, doubt that it is a map. Its a scroll of some kind. Maybe a proclamation from the homeland to be read to the attendees? 4 Pietro Paolo Gatta (1883-1965) Rita Gatta Furis and Aria Gatta Perna (daughters) with the assistance of Bob Ricci who did a side-by-side comparison with Pietro Gatta's passport photo. 66 Robert Colaizzi Renald Colonna Jr (nephew) but not certain of the identification. Mark DiVecchio (son) - my mother died on 18 Oct 2007. 258 Philander R. Morelli (Red) Pierina Morelli (daughter) Email from Pierina Morelli, Sep 2008: "I am writing to fill in some of the people that sit next to my grandfather #272--- one is my father--- #258--- Philander R. Morelli (Red) he was born in 1917 and passed away when he was 63 years of age. My father's was called "Red" for he had red hair and many freckles. I recognized him instantly in the photo. My father along with his brothers Paul (can't seem to find him), Robert (#256) and their dad (#272) owned Glasgow Tailors in downtown Youngstown. My father loved aviation---flying and owning his own plane by the time he was 16 years of age. He also was a ham radio operator. He married Madeline Agnone in 1952." 264 Ida Morelli Balmenti Pierina Morelli (niece) Email from Pierina Morelli, Sep 2008: "Sitting next to my father (#258) at #264 is his sister." 284 Elvira DiCianno Jay DeCianno (nephew) She was the second oldest daughter of Salvatore diCianno, #281. Elvira died on 27 Aug 2009. 292 Delia “Della” M. DeSanzo Dave DeSanzo - Email from Dave Desanzo, 28 Mar 2007: "Della passed away last night around 3:30 am at St. John's Home in Mars, PA. Mary told me tonight that it was a blessing and that Della has been extremely sick the last week or so. We plan to attend her funeral on Friday. I thought you may want to tell your mother the news. Please keep Della in your prayers. She was a very fine lady!" 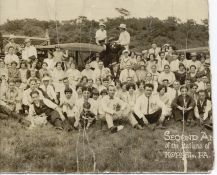 We are still searching for the photo from the First Annual Picnic in 1925. At the time of the photo: Tony, Mike and Stella DiSanza are children of Dominic & Giovannina (Frazzini) DiSanza and living in Mansfield. James and Tony D'Achille are children of Pasquale & Carmina Filomena (Frazzini) D'Achille also living in Mansfield. Antoinette & Orlando Disanze are children of Sam (Sabatino) & Addolorata (Quaranto) DiSanze and are living in Youngstown. Sam DiSanze & Dominic DiSanza are brothers, children of Amico Giuseppi & Maria Grazia (DiCianno) DiSanza, all of San Pietro. It does seem that they were grouped somewhat by family which may help in identification. Mike Musille & Tony Daley were great friends. (Best men at each others weddings!) Antoinette DiSanze later married John Mariani. I actually have a photo of Antoinette and Stella that must have been taken the same day, as they are both wearing the same outfits! Again, thanks for all you do. I am finally back from my summer trips and will try to get the pictures I promised to you, as soon as possible. I can also say WOW - you and Barb have done a tremendous job on the 1926 Reunion photo. This is by FAR the best restoration that I have seen. The copy of the photo that we found a few years ago is not at all as good as the one you have. I would, of course, love to have a copy. We are finding many, many people who are children and grandchildren of people in the photo. With your much(!) better version, I think that many more faces will be recognizable. I've added your ID's to the index on the web page. Can you tell me something of the history of the photo, like where you found it, who owned and how you did the restoration? I would very much like to feature it on my web page since the quality is so good. (PS we are still looking for the 1925 reunion photo). Of course my friend will email you the photo. She has put so much effort into it and has in the process fallen in love with the "cast of characters". She can tell you how she did it...she is a wiz! As far as the history of the photo, I will get back to you on that. My second cousin gave it to me and I can't remember what he said about it, so will find out and let you know. Hi Mark. My grandfather. Antonio P. Morelli was born April 13, 1891. He went by TP, short for Antonio Pasqual. He was married around 1920 to Pierina Anata Colevecchio, born July 26, 1894. Antonio's parents were Paolo Morelli, born 1844, and he married Lucia Carlino Jan. 14, 1866. Lucia was born around 1844. Paolo's occupation was a venterino (driver). Paolo's mother was Giacinta Carlino, born about 1815. Her occupation was listed as contadina (farmer). Paola's father was Sabitino Morelli, born around 1814. They were married around 1840. His occupation was a pastore (shepherd). Lucia Carlino's father was padre ignoto (father unknown...uh oh!!) but this may because they did not have a civil ceremony, and therefore it was not recorded. Lucia's mother was Carmina Carlino, born 1814. I also have the geneology for my Grandma, Pierina Colavecchio if you are interested. Have not heard back from my Aunt Nina yet....She came from San Pietro as a little girl....!!! We've seen many births where the father was not listed. Not common but not really rare either. One family that I helped trace back had one woman who had 9 children with the same unknown father. These were not teenagers getting pregnant. In most cases, the women were older. The father, for some reason, could not get married to the mother. Divorce was not possible so the father could have been previously married. So these fathers were most likely part of the family's everyday life. In the case of Carmina, I've found that she had six children with an unknown father. Her sister, Pasqua, had three children also with an unknown father. 1. All the records that I've seen from Italy shows Paolo Morelli's mother's first name as Giusta. 2. Paolo Morelli came over on one of the first ships of immigrants from SPA. It was the Ferdinand de Lesseps in 1882. He arrived with his brother, Matteo (or Mattia). After doing some checking, Susan is related to the families of Camellia Acker and Robert Morrison. Click here for the Acker Family web site. There are emails from Bob Morrison on my Odgen, UT web page. I am Susan's cousin Pierina Morelli--- I am named after my grandmother Pierina Colavecchio (wife of #272)---Susan told me the story about finding your website and subsequent emails that followed. I am writing to fill in some of the people that sit next to my grandfather #272--- one is my father--- #258--- Philander R. Morelli (Red) he was born in 1917 and passed away when he was 63 years of age. My father's was called "Red" for he had red hair and many freckles. I recognized him instantly in the photo. Sitting next to him #264 is his sister, Ida Morelli Balmenti. Though I grew up in Youngstown, Ohio I now live and work in Pittsburgh. I think this would make a wonderful story. 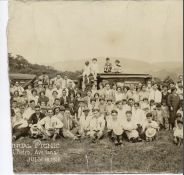 I just saw the 1926 San Pietro Avellana picnic photo on the internet and recognized my grandparents, Elisha and Blandina Colaizzi, and my mother, Lucy Colaizzi Holmes. Several aunts and at least one uncle appear in the photo also. I am wondering how to get their identifications posted on the website. I also noted that a Carmel and Bruno Colaizzi identified some people and I wonder if they are related. On the DiVecchio/Frazzini Notes 645 my mother and her sister, Sara and brother, James Colaizzi are mentioned. I recently came across quite a few old Colaizzi photos and would like to share them with Colaizzi family members or others who may be interested. I look forward to hearing from others. Thanks for your entry in my guestbook. I've been doing genealogy research for about 10 years and one thing I've learned is that everyone from San Pietro Avellana is related one way or another. I'd be really interested in learning what you know about your ancestors and try to connect your family tree up with other branches of the SPA family. And I'm always looking for photos to add to my web pages. If I don't have your grandparents identified, can you look at the index drawing that numbers everyone in the photo and let me know their numbers. I'll add that. In addition there are six children who are being held by the above family or around them that I could identify with a little further research and comparison with dates of birth and other family relatives. I am sorry I don't have time to send you photos but they will get there eventually. Send me an e-mail if you have questions. I appreciate anything that you do. I will add your idenitifications to my web page. It has been such a joy to work on this photograph. I LOVE history and art and good photography, so you can only imagine what it felt like when I found myself staring at your web site at about 1:00 this morning, having JUST finished my work on the photograph. It was so amazing to realize that there were other people in the world who cared about these wonderful faces as much as we do. Okay, to be able to tell you what I did on Photoshop, please tell me whether you are a Photoshop wizard, beginner, or somewhere in-between. That way I can give you the level of details you're interested in. I'm not a wizard, by any means, which is why it's taken me so long with many mistakes along the way! (Susan is a very patient friend.) So if all you're asking is what Photoshop program I used or just a sentence or two about it, then I won't bore you with too many details. Just let me know! I'd be happy to share details. P.S. Just for fun, I'm attaching two of the seven original pieces that I scanned and later knitted together. These two sections had totally broken apart and are actually separate pieces of photograph. No retouching has been done yet. I can't get over what a difference there is between the copy of the photo that you had and the one that we previously found. Even though yours was in three pieces, the faces were much, much more distinct. For Susan, me and other people who do genealogy research for the town of San Pietro Avellana, this photo is piece of history. I've probably been in touch with 200 people whose parents or grandparents came from San Pietro Avellana. My mother lived in Beaver Falls and I grew up in Aliquippa. Of the 300 or so people in the photo, there must be thousands of descendants around. For you and Susan to have come forward (after two years of work!) with this great copy means a lot to us. One thing we have found trying to do research is that for some reason, Italians did not talk much about the past. That might be just an indication of how difficult things were in Italy and with their uprooting and emmigration to the USA. So much of our connection with the past is through photographs, census and civil records. When I look at the small piece of the photo that you and Susan sent, I can instantly recognize my mother and my grandmother. With the previous version that we had, another researcher was the first to recognize them - amazingly since the quality of the photograph was so poor. 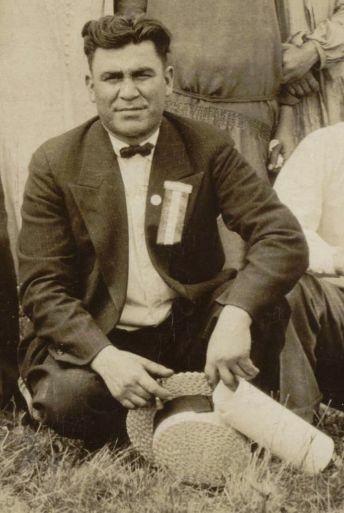 I've seen several possibilities for the man who was my grandfather but from the version of the photo we have, I've never been able to identify him. So, Barb and Susan, I hope you will give me permission to use the photo on my web page and to give out copies of the scans to anyone who asks for them. I know that it was a lot of work but I'd make sure that you get the credit and appreciation that you deserve. 1. How big were each of the 7 pieces? 2. What resolution did you scan them at? 3. How did you fit the seams together since they appear to be jagged on the pieces? 4. How did you fill in the cracks? 5. Any other details you would like to add. If you could write it up in the form of a little story, that would be perfect. I've told some fellow researchers about this and they are as excited as I am. You absolutely have my permission to use the version I restored on your web site and to share copies, and I know judging from our excitement yesterday, Susan feels the same way. I'll send you the final version as well as the unretouched version of the seven scans knitted together. (It was actually three pieces of photograph that I split into seven scans.) I'll tell you all about it! Today I have my hands full with my seven-year-old and a buddy of hers. So I'll work on eveything tonight. Here's the whole photograph, final version (for now, anyway). I'll send you the original (unretouched) pieces in subsequent e-mails. As I told Susan earlier today, now that I look at it closely, I wish I had done more nit-picky work on it--if I'd known that people would be studying it up close, I probably would have, and maybe still will. I thought I was doing the restoration so that Susan and her relatives could make framed 8" x 36" photographs to hang on their walls. But had I known there were so many people out there with an up-close interest in the photo, I would have taken more time on each face and clothing details. Some background info about how I did it... Sorry, this will be a long description, but looking back on it I learned so much, and I love being able to tell someone the whole process! (Susan's eyes glaze over when I tell her. Even if it's over the phone, I can feel her eyes glaze. Ha.) Anyway, I will start my story by admitting that the two-year time span was 9/10ths my procrastination, and 1/10 re-doing it three separate times. About two years ago, it all began when Susan showed me the photo one day and I said I thought I could retouch it in PhotoShop, figuring the whole thing would take maybe five hours max. She got a scan made at a local, good-quality photo store, and they scanned it in several pieces. At that time, I didn't know how to merge two separate pieces together but I thought I could teach myself. I did it the wrong way, using a 19-pixel Photoshop brush, plus I had cropped one of the scanned pieces ever so slightly, changing the size of the image ever so slightly, so of course things didn't match up when I went to merge them. That part probably took me between 25 and 50 hours, with numerous false starts, but finally I got all the pieces merged together. I didn't know that Photoshop has a 300-pixel brush available to use, allowing one to select larger pieces to merge. Using the 19-pixel brush felt a bit like washing an elephant with spit and a sponge the size of a dime. I also learned late in the game that if you make the background red instead of gray by default, you can tell where you've missed because it remains bright red until you cover the area. (Tells you where you haven't been yet.) I can explain that in more detail if you're ever going to merge two photos together. Makes a huge difference--essential to know. Anyway, after the merge I worked on the individual faces and clothing and sky and grass, erasing dots and scratches and cracks, and rebuilding missing ears or eyes (by clone-stamping pixels from the left eye/ear to the missing right eye/ear, for example). I love that kind of nit-picky work, so I could do many hours at a stretch, quite happily. I generally used a 9- or 13-pixel clone stamp to do this fine work, with the photo zoom set at about 300%, so that the face I was working on filled most of my computer screen. The nit-picky part took maybe 100 hours or so. But there were problems with glare spots that obliterated whole faces, turning them into white spots. The quality of the overall photo reproduction was fine, just those darned white spots. And as I continued to work, it eventually occurred to me that glare spots maybe could be avoided somehow, but I'd already put in all that time. Definite low point--I got very discouraged. This was early September last year, right before Susan's reunion, and it was awful to have worked so hard and come up short. I felt in my gut that I should really start over with a new scan, but I couldn't face it, couldn't face doing it all over again. And I knew I wouldn't have time to do a full re-do before the reunion, so I just gave up. Susan remained my friend. We talked with the photo store folks about the glare and they said they couldn't avoid it, couldn't give us a cleaner copy with their equipment. So last fall we had it re-scanned at a different, higher-end photo shop. They had a large scanner and could do the whole thing in one scan, which was wonderful, because it meant I wouldn't have to merge the photo together again. Yay! I had high expectations for this version. I tackled it this summer and got most of the tiny pixel (nit-picky) restoration done again. This time around, though, the restoration seemed easier, like I didn't have as many dots and scratches to fix, which was odd, but hey, I wasn't complaining! Anyway, there were some very tiny areas of glare with this scan also, so I borrowed the original photo from Susan and decided to scan the affected areas on my dad's 10-year-old HP scanner that he got as a freebie when he bought his computer. I had not considered using this scanner from the get-go, because it was not a high-end scanner, and it only had a 9" x 12" glass. But I figured for half-a-dozen faces, it would be okay, resulting in an unnoticeable correction. So I scanned a small piece, intending to "clone stamp" from one scan to the other, placing the corrected image over the glare spot. Kind of a cut-and-paste. Makes sense, right? Except that what I found, when I looked at what I had just scanned using the 10-year-old scanner, was that my scan was much clearer than the scanned version I'd been working on. Oh, no. In fact it was a huge difference, the kind of difference that made me realize I was looking at starting all over again. (Later I figured out that the reason it was easier to restore the second scan was that it was a highly pixelated version, with many of the wonderful details missing--less to see, less to fix.) I'm guessing that at the high-end photo shop, in using a large scanner with an obviously oversized photo, and in doing it all in one scan, they probably used a very low dpi resolution. Why else would we have ended up with a highly pixelated version of the photograph? My dad's scanner has different settings but the highest setting, 1200 dpi, took 10+ minutes to scan the first piece (which was okay), but it actually made the jpeg too large to manipulate on my computer. This first piece, which I called Piece AA, was 8" high x 3.5" wide, a real snippet of the whole photo, and it was something like 28,000 KB, as I recall--for just three-and-a-half inches of the photo! So I felt I had no choice but to scan at 600 dpi--not as great a level of resolution, but the results (which you've seen) were better than the first two professional scans, so I was contented if not deliriously happy. I took the three pieces of the original photograph and scanned them in six parts, (remember my scanner has a limited glass size), and these are Pieces AA BB CC DD EE and FF. Piece AA is one photo fragment, measuring 3.5" wide. Pieces BB and CC are one photo fragment, measuring 16" wide, which was actually just a smidge too wide to scan as two pieces, so I had to add a middle scan, labeling it Piece BC. The third photo fragment is the largest, measuring 20" wide, requiring three scans, DD, EE, and FF. I decided to merge the seven pieces before trying to do the actual photo restoration. For one thing, if I couldn't merge them for some reason, I didn't want to put all that work into the restoration part again. Now that I know I can do it all, I would probably reverse the order: fix faces/clothing first, and merge last, because the photo once merged became very unwieldy to work on. The seven-piece merge itself went without a hitch this time. I had learned a tremendous amount and made no errors. But, when I started the scratch/spot/face fixing, I found when I went to save the file, it wouldn't allow me to save it at high resolution, saying I didn't have sufficient RAM. What??? The whole thing was only 20,000 KB. Wouldn't let me save it. So I was forced to save it each time on medium resolution, which almost killed me as you can imagine. I even went out and bought 1 GB of RAM. Hubby installed it. Still said I didn't have enough RAM for a high-resolution save. So as a result, I'd work on it for 6-8 hours at a stretch without saving it, fearing that each save was degrading the resolution. That was the only thing that drove me crazy on this third restoration attempt. Working for 8 hours at a time without a save was risky, but I never lost my work, or you might have heard me wailing all the way out in California! The restoration on this final go-around probably took 8 or 9 eight-hour sessions. Anyway, I know this is a long-winded explanation but now that you know all of it, you can see why it's hard to say what I did in one paragraph. Didn't do anything right the first time. Learned a lot along the way. So if you want to put my name down as having done the photo restoration, that'd be lovely. You can just put my name (Barbara Eason Himes) and say I'm a Morelli family friend. I'd be happy to give details to anyone who's interested, so you can include my e-mail address or not, as you wish. I just don't know how to capture what I did in a blurb, especially since most of it was trial-and-error. I guess I'm not a blurb kind of gal. So. Maybe down the road I'll attempt one more restoration, now that I know what I'm doing, and I can really focus on the details. I let hands and other relatively minor body parts go when the photo damage was too great in some places. I would have worked harder on individual faces except that, as you now know, I took the long road to get where we are now. So that's my story. I'm so happy that the scan and restoration I did give you many details you didn't have before. That is wonderful to know that people will be identified because of my efforts. Means a lot to me. I'll send the original scan pieces under separate e-mails. I wouldn't even mind trying to scan them again at the highest resolution, but I won't be able to manipulate them. You sound wonderful in your e-mails and I'll tell you that Susan is a terrific friend, a truly wonderful person. I'm so glad to know her joy at finding others who love this amazing photograph and are connected to it like she is. I started with piece AA, then merged each piece to the right, adding BB, then BC, then CC and so on. I didn't worry about the big chunk of red where apparently one scan stopped short, since it was all sky anyway. This scan is the one I started with to do my final restoration work. relatives a bit of nonessential photo that would be covered by the mat or frame. Mark's note: Here are small versions of the seven scans that Barb used for the restoration. I just used tiny versions here so you can see what she did. Barb sent me multi-megabyte versions of these. lists an "E. Gluck" at 4206 Main St. Pittsburgh, PA. That is an address in Bloomfield (an Italian section of Pittsburgh). 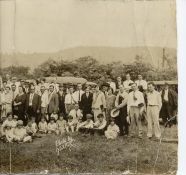 Interviewer: David De Sanzo Sr.
Lloyd E. Gluck is the son of the late Eugene Gluck, the photographer of the panoramic photograph titled “Second Annual Picnic of the Italians of S. Pietro, Avellana Koppel, PA. July 18, 1926.” Lloyd was only 14 years of age when the Koppel photograph was taken. Lloyd frequently traveled with his father on many of the photographic shootings. However, Lloyd did not remember this particular photograph. Eugene Gluck (EG) was best known for his outstanding panoramic photographs - including many of the famous bridges and landmarks in Pittsburgh. Eugene Gluck was also sought after to do photographic work for many of the prominent attorneys in Pittsburgh for their law cases. Eugene Gluck operated a photographic studio at 4206 Main Street in Bloomfield, Pennsylvania. This studio and its contents were destroyed by fire. The negatives were very flammable. After the Bloomfield fire the photo studio moved to Penn Avenue and then to Oakland. Lloyd described his father’s special mechanical camera and how it operated. The camera itself had a number of small little wheels similar to cogs. A large roll of film was loaded in the camera. The camera swung in an arc. The camera moved very slowly as it took the panoramic photograph from one side to the other. Eugene Gluck always curved the people in the panoramic photograph in the same mechanical arc as the movement of the camera so that every person in the photograph was equidistant from the camera lens and in focus. Eugene Gluck used different gears in his camera depending on the size of the panoramic photograph, thus changing the mechanical arc of the camera. Regardless of which gear he used in his camera, the people in the panoramic photograph would always be arranged in the same arc as the camera. On a more comical note, Lloyd remembered that there was always one character in the photograph that would get their picture taken twice - once on each end. This individual started out with their picture taken on one end of the photograph and ran behind the group of people to the other end of the photograph - beating the camera as it was swung around. Lloyd stated that his father primarily did group photographs in black and white. However, he also did Sepia. EG used a pen to imprint the lettering on the front of the photograph. This was risky because it was done free hand, leaving no room for error. Consequently, the lettering was not as neat as he would have liked at times. EG wrote the letters on the first print. 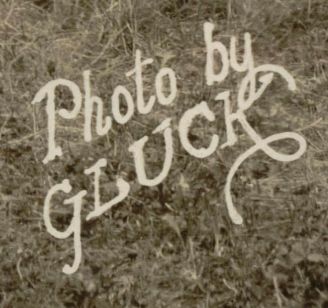 The notation “Photo by Gluck” on the front of the photo meant that Eugene Gluck took the photograph himself. EG also produced picture frames for his photos. Lloyd stated that his father would never appear in any of his own photographs. He did not believe it was ethical. Eugene Gluck had a very large clientele. He never had to advertise for customers. He believed that word of mouth was the best form of advertisement. The Italian immigrants in Pittsburgh made up a large part of his local business. They would come to his studio to get photographs taken to send home to their mothers and fathers in Italy. The Italian immigrants always insisted on a full body picture, head to toe. The portrait had to include the legs so that the mother knew her son was doing well. EG also did work for Warner Brothers Studio, President Woodrow Wilson, and the President of United States Steel. Lloyd recalled one movie in particular that Warner Brothers was shooting in Pittsburgh. The main character Paul Mooney stopped Warner Brothers from shooting the movie for a day because Eugene Gluck was not available. The entire movie cast was held over at the William Penn Hotel until EG arrived home from his out of town business trip. EG even assisted his son Lloyd in establishing the first military photo lab. Lloyd Gluck was very proud of his father and his excellent photographic work. His father was a very modest man and took great pride in his work. Lloyd remembered one thing in particular that his father told him. One day Lloyd was watching his father install a picture into a wooden frame. Lloyd was just a little boy and was very hungry at the time. Lloyd asked his father, “Why do you use so many nails in the back of the picture frame? No one will ever know the difference.” Eugene replied, “But son I will know.” Lloyd lived by these words and conducted his long legal career in accordance with his father’s advice. The fire at the shop probably means the original negative of this photo is lost. Here is an article about Lloyd Gluck from the Pittsburgh Post-Gazette. Just one question... So who had the money in 1926 to hire such an extraordinary photographer as Mr. Gluck? I would imagine few photographers back then, or today for that matter, could have produced such a masterpiece. Lloyd Gluck died on 14 Mar 2011 - article in the Pittsburgh Post-Gazette. I have a scan of an example of a panoramic photo taken by Eugene Gluck who is listed on your early Pittsburgh Photographers web page. 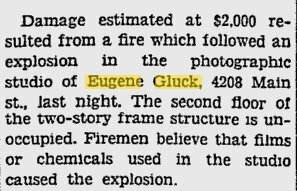 I note that Lloyd Gluck, Eugene's son, passed away last year. We had spoken with him and he gave us some history on the photos that his father took. It was a real pleasure viewing that panoramic photo, the detailed reclamation obtain through the restoration by Barb was excellent. I feel I can "almost" touch all those picnic-loving people! This excites me due to my interest in photography and handling these types of pieced together files. Your website is an enjoyable historical read too, quite entertaining. With your permission I'll add a link to your page from my "Early Photographers" webpage? Keep up the great work! Have enjoyed very much your excellent restoration of the Italian-Americans picnic in Pennsylvania in 1926. The full resolution copy is laid across the three screens here and have been able to study all the different people and wonder how they went on with their lives. It’s almost as if I too were in the picture, perhaps because wishing I had been. It's really a grand picture. The little children many of them likely had to fight in World War II. Every one of those folks had a story. I got this nice email from someone who really appreciated the effort put into the restoration of the 1926 Picnic photo. Thank you for sharing this happy note! I've wondered from time to time if anyone stumbles across the photo anymore--after that exhilirating time when Susan and I first connected with you. You can't imagine how much fun that first moment was for me, to find a group of people who cared so much about the faces I'd been staring at for so long. I'm much better on Photoshop now, by the way, so much so that I can't bear to re-visit my description of my painstaking self-taught efforts to stumble through the restoration! Paul and Jean sound like charming folks, and fellow lovers of history. I'm so glad the photo restoration continues to bring joy. Please relay my gratitude to them. Their letter brought a smile to my face. I am Keith Colonna in Cranberry Township PA, the grandson of Renald Colonna (#48) and Clara Colaizzi (#53), from your wonderful picture. My cousin's daughter found your web site and her aunt subsequently forward information about it to me. First and foremost, what a wonderful effort you have made here at tracking this history and working on the photo restoration with Barb - she did an awesome job. Thanks so much, it is terrific. I can identify a couple of the youngsters in the picture - they are my father's older siblings. My father was not yet born for this picture, he arrived in 1930. #60 is Albino Colonna, Renald & Clara's oldest child, born in 1920. I believe he passed away in 1977 but I'm not 100% sure on the year of his death. her within the past week. #52 & #54 are Albino's sisters but I'm not sure which is which. These are Vivian (Colonna) Parker, born 1920 and still living and Angline (Colonna) Bartoe, 1921-2006. I downloaded the 11MB file tonight and I'm going to try to order it from Miller Photo - from their MPix consumer site (Miller is a professional printer). If I run into problems though, I may ask you for a CD with the file and would be glad to pay for it / shipping etc. My father thought that #66 might be his Uncle Bob (Robert) Colaizzi. Not certain. Again this is so terrific - thanks much. Thanks for your email and all of the ID's of your family in the SPA picnic photo. The 11MB version of the file should print fine. The original was 36 inches wide. I have a 284MB version that I can send you if needed. I have census sheets showing your family in Beaver Falls and a few other documents about your family. If you would like copies, I can email them to you. I have an update - Gloria's daughter (my cousin) weighed-in and she knew a little more than I did. #52 is Vivian Colonna Parker. I had not noticed in the original that my grandfather, Renald Colonna, was holding Vivian. BTW, Renald's actual name on his birth certificate is Rinaldo with an "I" - it seems his name was Anglicanized / Americanized at arrival. #54 is Angeline Colonna Bartoe - confirmed by Gloria Colonna Uhlig. also has relatives in this photo. This video was done about 4 years ago. Its based on our photo of the 1928 SPA picnic in Koppel that Barb did so much work on. Click here for some photos of future SPA picnics and reunions.